If you would like to enjoy a beautiful water garden, but live in an apartment or condo and just don't have room for a real garden pond, then a miniature tub garden can solve your problem. Enhancing the balcony or patio, a tub garden brings the setting alive with unusual beauty. Children find the miniature water kingdom fascinating and take great pleasure in the growth and blossoming of the aquatic plants, the progress of water snails, and the care and feeding of small "tub" fish. Tub gardens are so simple that children can easily plant and care for one of their own. Your tub garden should to hold at least four gallons and be completely sealed. 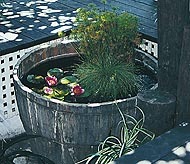 Ceramic pots, old crocks, wash tubs, and galvanized horse-troughs make excellent barrel gardens. Leave them above ground or sink them. Wine, whiskey and olive half-barrels make great tub gardens; however, caution! They usually contain bacteria harmful to plants and fish (even after charring). We suggest lining the barrel with a 4' x 5' sheet of EPDM pond liner and securing the edges. For a really novel approach, try an old fashioned, claw-footed bathtub on the terrace. As you can see, there's no end to the possibilities. Have fun! Planting in such a small body of water is perhaps simpler than in large ponds. It's back to basics.